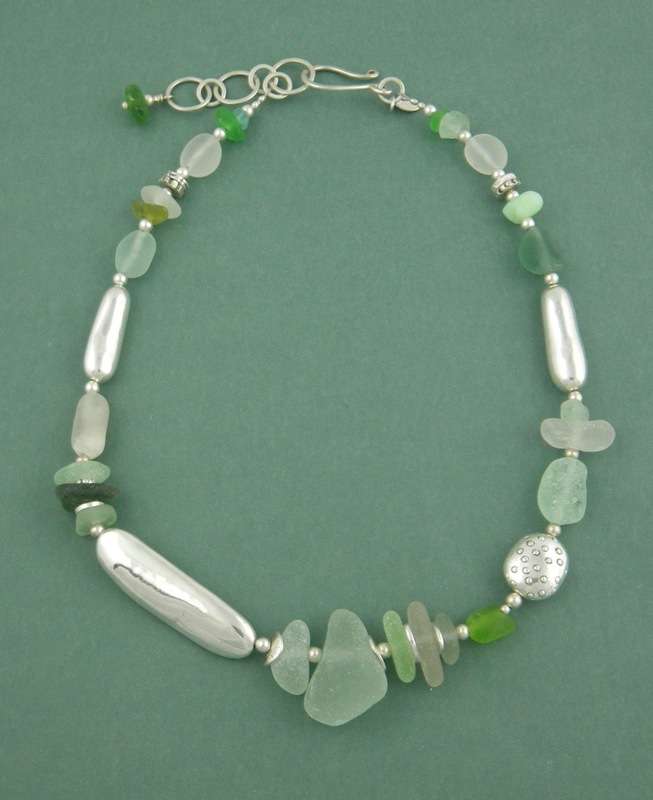 ← Welcome to my first time at the Bead Soup Blog Party! Meanwhile, I spent my day baking bread, and bread and bread which always a centering activity for me. Tomorrow is the Islesford Fair, and I like to make a contribution to the baked goods table. It was funny how I used two different sourdough recipes today, and all of the bread came out incredibly flat. I wonder if it’s the humidity or what. The bread still tastes fine. (No flatness in the flavor!) I also made a batch of almond chocolate chip shortbread cookies, with rice flour so they would be gluten free. I happen to tolerate gluten just fine, but I feel bad for the folks who can’t, especially at a bake sale. The Islesford Fair is a cool celebration and fund raising event to benefit the non-profit groups connected to our little island. Different booths and activities benefit different groups. I think the baked goods benefit the Islesford Neighborhood House. There are usually t-shirts to raise $ for the fire department. Books to raise $ for the Historical Society, sales of hot dogs and hamburgers benefit the Congregational Church, and so on. There is a LOT going on there, so if you’re in the area on Tuesday, hop on the mail boat or the Cranberry Cove boat and check out the fair. There is also a silent auction to which I donate jewelry every year. My piece this year goes to benefit the Acadia Family Center’s Nathan Bright Keegan Memorial Education Fund. It is a cause near and dear to my heart. I took a few photos of the necklace before dropping it off today. Now I’m going to see if I can get to bed before 11. More helpings of soup will have to wait until tomorrow, after the fair. Yoi ate sich a generous soul! Your necklace is stunning…I am positive it will fetch TONS!!!! Thanks Patti. I live in a pretty generous community, so it’s nice to give back when I can. I never heard who ended up with the necklace, but I hope they enjoy it. Yet another beautiful necklace! :) And the bread and cookies sound lovely too! Your necklace is beautiful and so is the cause that it will benefit. Great job! Oh, Barb, that necklace is a beauty with the soft green against the silver and those bright greens. I’d turn out for the celebration if I could. Enjoy! Very nice necklace, Barb. I didn’t see much of the stuff in the tent area, which is where I’d guess yours was? I haven’t heard any financial details or answers as to how it went, but I hope well! But the pictures are lovely. I think anyone who goes to the fair could go home w/ a new supply of t-shirts! They were there for the volunteers, fire dpt, emt’s, wooden boat school, and at least one other. I hope all did well! It’s a wk later, but 11:30p, so here’s hoping you’re chasing zzz’s. I have a brief article to complete and have been distracted multiple times so far. Plus off tomorrow at about 6a to be in Bangor by 8 or 8:15…. Thanks Sally. All the silent auction stuff was in the tent area. It seems the crowds are not so crowded this year, no matter what the event. These recent posts are making me a little peeved that Texas and Maine are so darned far apart! I’d love to have hopped on the mail boat and scooped up your goodies. Nicely done; I love the picture you paint of your community–so very different from the suburban sprawl of mine. It’s a pretty special place. Also pretty tiny at times. No suburban sprawl, but there is summer boat traffic sprawl…. It would be pretty cool if Texas and Maine were closer to each other. More variety with less travel! We could meet for real! P.S. my hosts in MA who we stay with every year for vacation couldn’t stop talking about how much they love The Secret Life of Lobsters. Thanks for the recommendation. So glad they enjoyed it! Trevor Corson is a great writer. 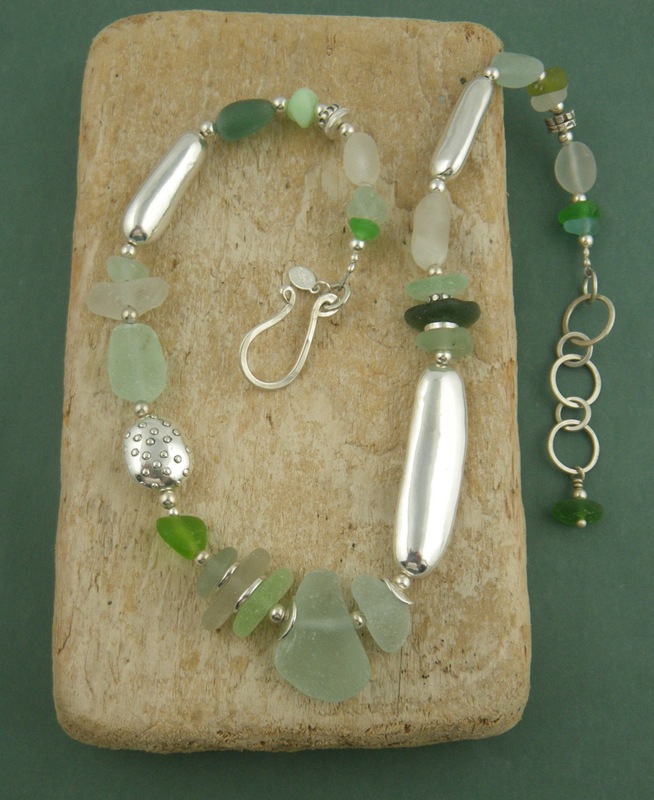 That necklace is to die for… I love sea glass.. and I love green.. lol great job.